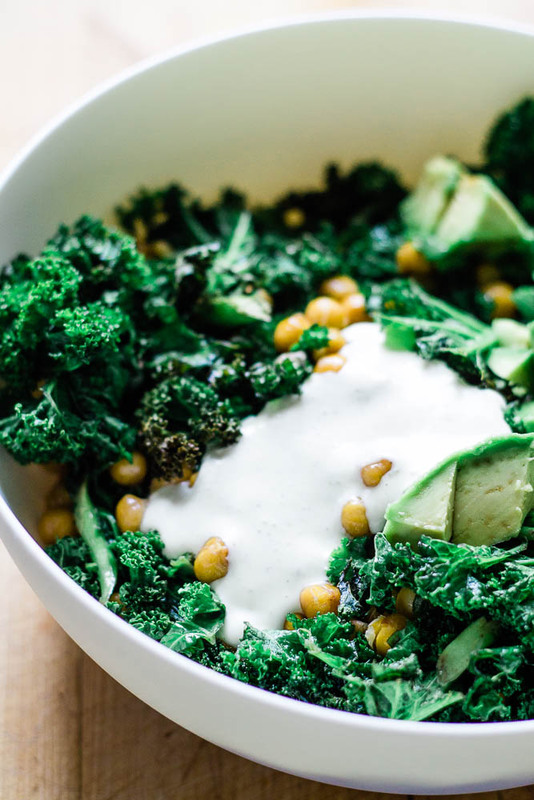 You’re going to roast both your chickpeas and your kale. First you’re going to roast those chickpeas for 12 minutes and then add your kale to the pan, right on top of the chickpeas, and roast for another 8 minutes. The chickpeas don’t get as crispy because they spend some time covered up but I think it works well. I prefer them not to get overly crunchy for this recipe, I still want some softness in the middle. And then we’ll put the hot ingredients in a bowl, add some avocado and dressing and toss it all together. We don’t heat it up any more – we let the dressing and avocado cool the hot ingredients down a little, and the result is nice and warm. Sooo first up, to make a vegetarian Caesar dressing, we need a replacement for anchovies. That’s easy. Say hello to capers! Capers swoop in and make briney magic happen without any need for fish. Job done. And while we are breaking tradition here… let’s just give up on authenticity and use a greek yogurt base. Greek yogurt is something that most of us have in our fridges, and it’s healthy and creamy and amazing so I see no need to use raw egg yolk for my Caesars. We’ll blend the yogurt with capers and all the other usual suspects – garlic, lemon, mustard, parmesan – and the result is pure luxury. 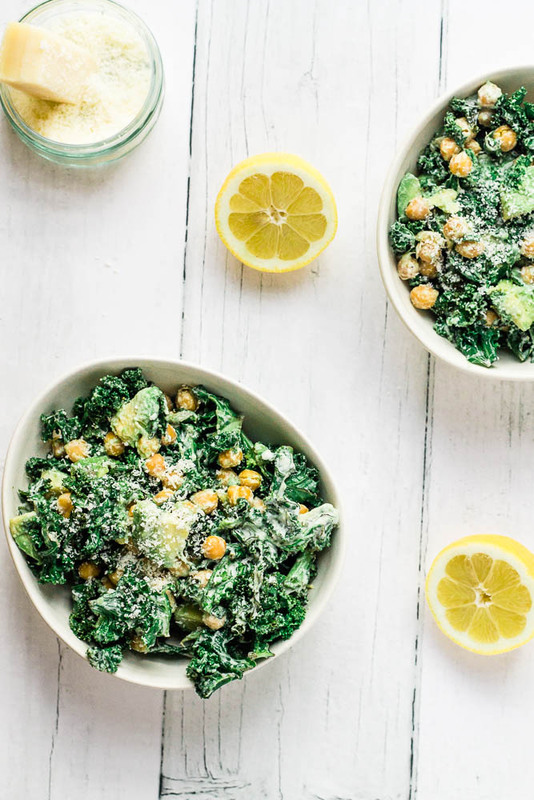 It’s a strongly flavored dressing for sure, and I love how it pairs with the roasted kale and chickpeas. Where a thick, heavy dressing like this might overwhelm lettuce leaves, it’s a real match for the thicker kale leaves. This recipe makes enough for two as a lunch or light dinner. Bulk it out with some fresh bread to make a more substantial meal. It would also be a nice side dish for four. If you want to scale up this recipe, you totally can. 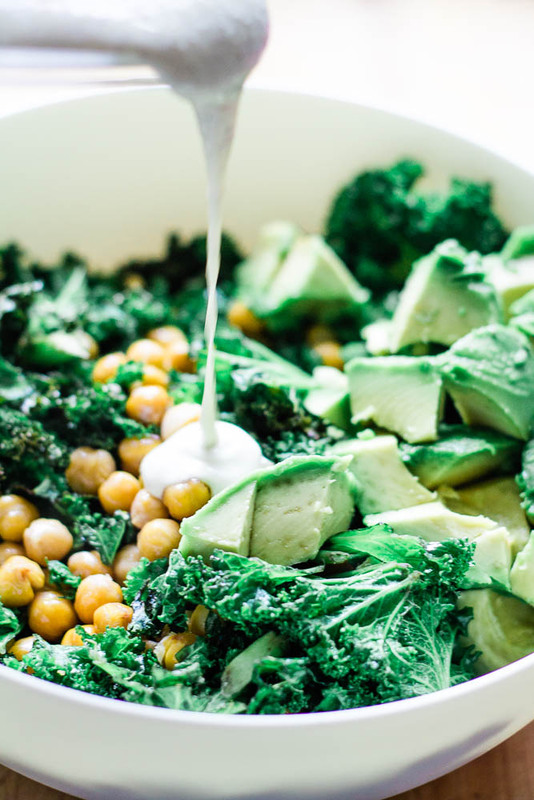 You would just have to cook your chickpeas and kale in separate (larger) pans because otherwise the kale is going to be piled too high in one pan. So when the chickpeas have been in the oven for 12 minutes, move them to a lower shelf and add the pan with the kale on the top shelf. 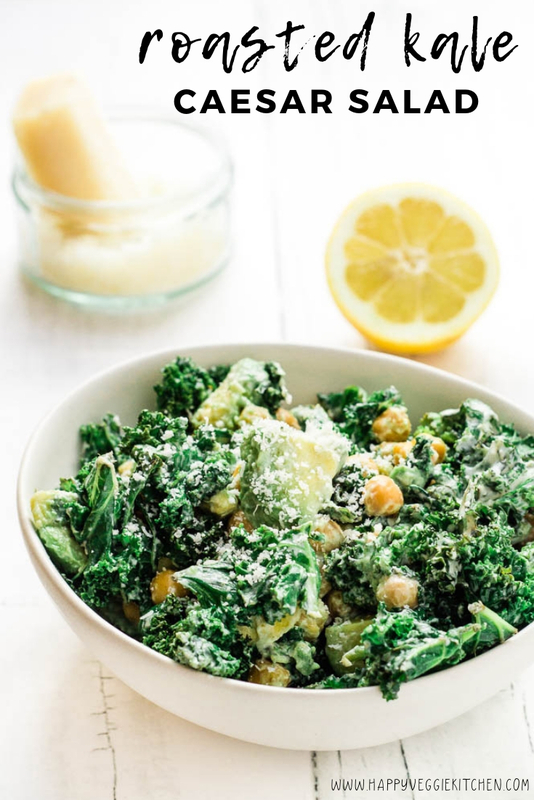 A warm roasted kale salad with chickpea croutons, avocado and a creamy Caesar dressing! This is easy to make with an amazing texture. Served warm, it's the perfect winter or summer side dish or the basis for a light meal. The vegetarian Caesar dressing is Greek yogurt based, intensely flavorful and luxurious! Pre-heat the oven to 180C / 360F. Bump this up to 200C / 390F if your oven is not fan assisted (convection). Brush a large skillet or shallow casserole dish with olive oil. Spread the chickpeas over the pan and toss to coat in oil. Sprinkle with salt and put in the oven for 12 minutes. While the chickpeas are cooking, prepare your dressing by blending all of the ingredients with a hand blender or mini food processor. Once the 12 minutes is up, remove the chickpeas from the oven and use a spatula to toss them around on the pan. 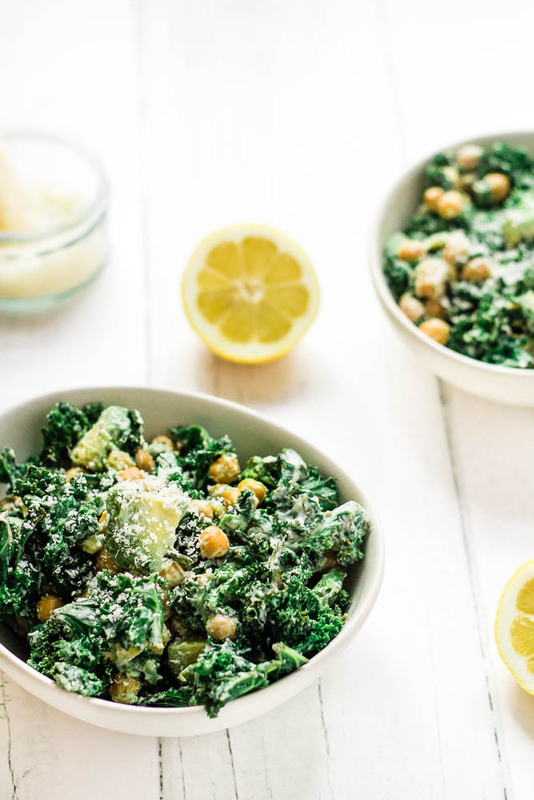 Now cover the chickpeas with the kale, spritz or brush the kale with oil, and sprinkle with salt. (if you have space, you can push the chickpeas to one edge of the pan so they're not going to be covered - but if your dish is too small it's OK to layer up, they just don't get quite as crispy). Cook for another 8 minutes until the kale is soft, but getting crispy on the edges. 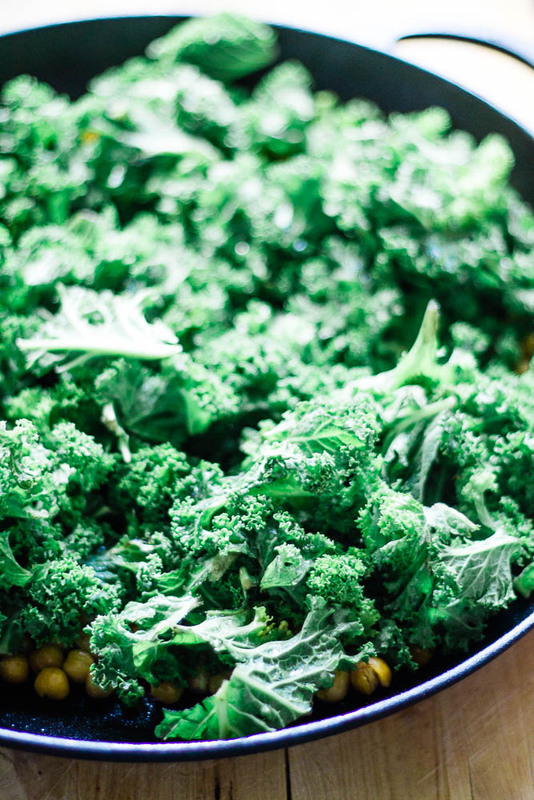 When the kale is done, remove from the oven and spoon out the chickpeas and kale into a bowl. Top with avocado and dressing, and toss to combine. Garnish with additional grated parmesan cheese, if desired. Your chopped kale needs to go in the oven as dry as possible, so I like to use pre-washed bagged kale for ease here. If you need to wash your kale, I suggest doing it well in advance and then storing it in a salad spinner so that you can put it in the oven dry. If your kale is freshly rinsed and has a lot of moisture on it, it will steam more than roast in the oven. I personally use a vegetarian parmesan style cheese rather than true parmesan which is made with calf rennet (it has to be in order to be called parmesan within the EU). I like Twineham's or Ocado's own brand. 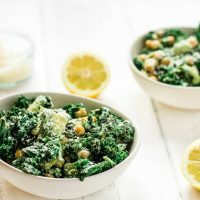 To double this recipe, you need to cook your chickpeas and kale in separate (larger) pans because otherwise the kale is going to be piled too high in one pan. So when the chickpeas have been in the oven for 12 minutes, move them to a lower shelf and add the pan with the kale on the top shelf.